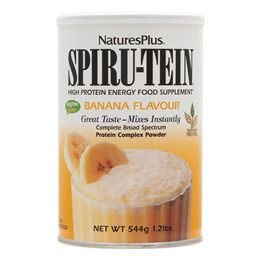 Nature`s Plus Spirutein Banana delivers a healthy infusion of soy-based protein, along with other essential nutrients. Spirutein Banana is a creamy, delicious treat for low-calorie diets. It contains the pioneering, patent-pending tri-part protein blend of non-GM rice protein, pea protein, non-fermented and fermented soy. Proprietary Non-Gmo Protein Blend (Rice Protein, Pea Protein And Soya [Isolated Soya Protein And Fermented Soya]), Fructose, Bulking Agent (Maltodextrin), Tri-Calcium Phosphate, Natural Banana Flavour, Natural Vanilla Flavour, Potassium Citrate, Magnesium Oxide, Thickener (Guar Gum), Oat Bran, Anti-Caking Agent (Microcrystalline Cellulose), Spirulina, Ascorbic Acid, D-Alpha Tocopheryl Acetate, Choline Bitartrate, Inositol, Apple Pectin, Bee Pollen, Niacinamide, Vitamin A Palmitate, Zinc Oxide, Manganese Sulphate, Ferrous Fumarate, Calcium Pantothenate, Lecithin (From Soya), Lemon Peel (Supplying Naturally Occurring Bioflavonoids), Papaya, Pineapple, Chlorophyll, Pyridoxine Hydrochloride, Riboflavin, Thiamin Hydrochloride, Cyanocobalamin, Ergocalciferol, Folic Acid, Biotin, Potassium Iodide, Chromium Chloride, Sodium Selenite, Sodium Molybdate. Add 34g of Spirutein Banana (scoop included in tin) to 237ml of milk, juice or water and stir, shake, or blend for a delicious, high energy shake. 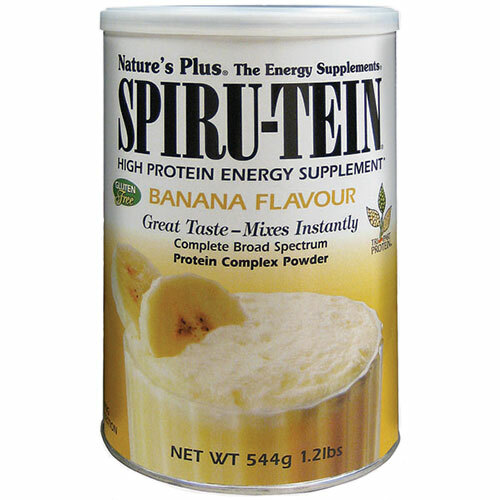 Below are reviews of Nature`s Plus Spirutein Banana - Protein Complex - 544g by bodykind customers. If you have tried this product we'd love to hear what you think so please leave a review.